The folks at ACT have released what they're calling the 2018|2019 ACT Practice Test. Test prep gurus and professional tutors of all sorts have seen this play out enough times to know that "new" content from the ACT isn't generally new. So what's the deal with ACT 1874FPRE? Where can you download a PDF of the new ACT practice test? And how should you use it with your students? Is ACT Test Form 1874FPRE New? As you probably already suspected, the new practice ACT test for 2018 | 2019 is not actually "new. It's a repackaged version of the April 2017 ACT test (Test From 74F) with a modified test form number, 1874FPRE. I haven't gone over it with a fine-tooth comb yet, but the English passages are identical, which effectively makes it impossible for tutors to use this test in conjunction with the TIR (Test Information Release) version of 74F from last April. Why Should Test Prep Tutors Be Happy that ACT Released This Test? Well expert tutors often forget that not everyone gets copies of the TIR tests. ACT's decision to release this test more publicly as an official practice test does have the effect of leveling the playing field among students who choose not to work with a professional tutor (or can't afford to work with one). That much, at least, we can celebrate. Test prep got a bit fairer today. So, if you're a student who landed on this blog post for tutors, you can still use this link to download a copy of the latest Official ACT Practice Test. Tutors, I realize that you almost certainly already had a copy of test form 74F, but I'd suggest that you begin using this version instead. ACT has made some efforts to reign in the circulation of its TIR tests. It began by formally shutting down CrackACT.net. It has switched its policy on international testing to offer ONLY computer-based administration. ACT recently lumped Canada in with the rest of the world by making it subject to ACT's international testing policy. Beginning in the fall of 2018, Canadian students will have no paper-based testing option for the ACT. If they want to take the test, they'll be taking it on a computer screen. Naturally, that will affect the nature of test prep for international students by forcing tutors to offer test prep that includes computer-based test prep. This of course raises the possibility that we're seeing an advance screening of the changes that will come to the U.S. test prep market in the next few years. To that end, we invite you to check out the Clear Choice Test Prep system. Should We Expect More Downloadable ACT Tests? Probably not. To date, ACT has stubbornly refused to follow the College Board's lead of releasing an adequate supply of practice tests. One visit to ACT's homepage, actstudent.org, reveals that ACT's priority seems to be launching/promoting ACT Academy. This rerelease of ACT Test Form 74F (as ACT Test Form 1874FPRE) seemingly signals that ACT intends to continue to severely limit access to authentic test prep resources. 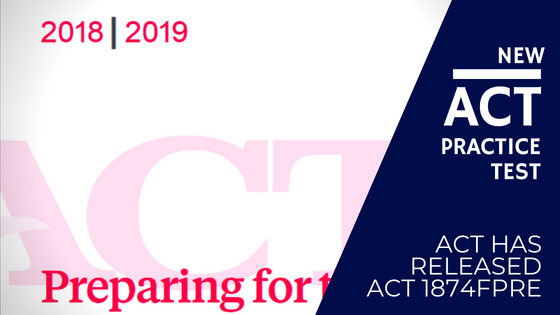 How Should Tutors Use ACT Form 1874FPRE? Ultimately, that's up to each individual tutor. 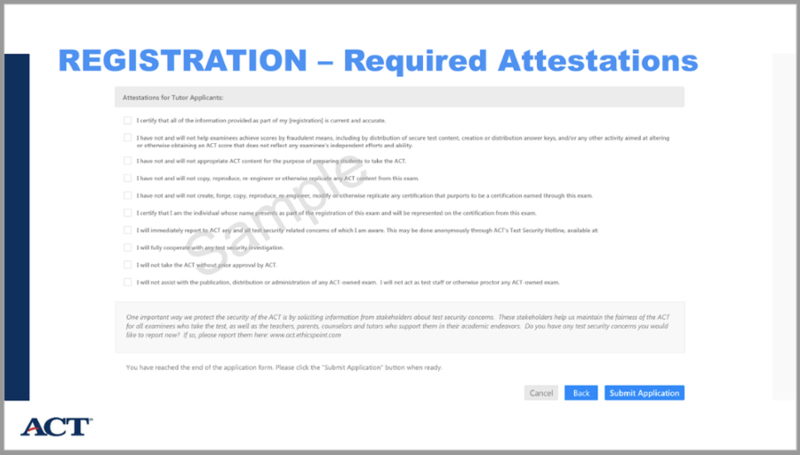 Recently, ACT made a lot of tutors pretty nervous by adding a page of "Required Attestations" to the registration packet for it's new in-person ACT Tutoring Certification Course. act as test staff or otherwise proctor any ACT-owned exam." That's a pretty big deal. Many test prep tutors use real exams as a means of evaluating the effectiveness of the test prep they offer. Honestly, it's best practice to use an authentic test to establish the student's baseline score and identify the areas of greatest potential improvement. The irony, of course, is that signing this pledge is a prerequisite to attend a training course where one would expect to learn exactly the sort of best practices that you've just sworn not to uphold. Weird move, ACT. Weird move. One could easily argue that all that ACT is asking of tutors is to purchase its practice tests -- presumably once you've bought the thing it's no longer an "ACT-owned exam." Sure, that would make sense. 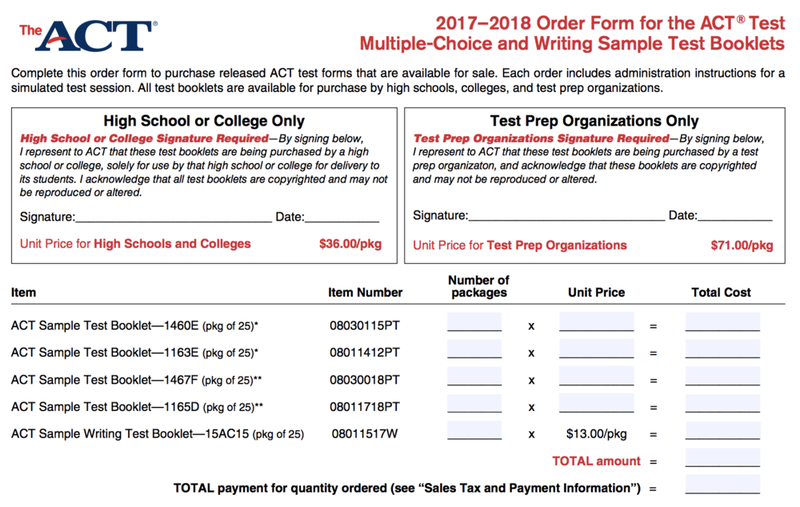 But first, ACT would have to do its part by making a few of the more recent, representative ACT tests available for purchase. Currently, you can order these four retired ACT tests directly from ACT: 1460E, 1163E, 1467F, 1165D. For those of you who haven't followed the evolution of the ACT, you may think that one test is as good as any other. Yeah... not so much. The tests on that list are go back as far as April of 2005. That's right, 1460E is more than 13 years old. The most recent of those tests, 1467F, was administered in April of 2011. Yup. The "newest" of those tests is more than seven years old. To put it another way, if you'd broken a mirror the day that 67F was administered, you'd already have weathered all the bad luck. Suffice to say, if you're administering these tests to evaluate the effectiveness of your test prep tutoring, then you're doing it wrong. Then again, that's just my opinion. If you want to use those tests, you're free to do so. You can access the order form here: Download the ACT Practice Test Order Form Here. NOTE: When I started this post, it was going to be a short and sweet lead-in for the link to download the new ACT Practice Test. Obviously, the scope expanded a bit. Hopefully, dear reader, you'll find some use in all the additional context that made its way into the post. Either way, thanks for reading. Please take a moment to like, share, and subscribe! Is Your Test Prep Business Capitalizing on the August SAT and September ACT?